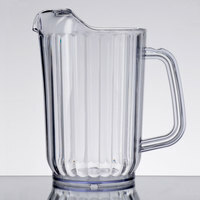 Easily serve a wide variety of cold beverages with this Choice 32 oz. 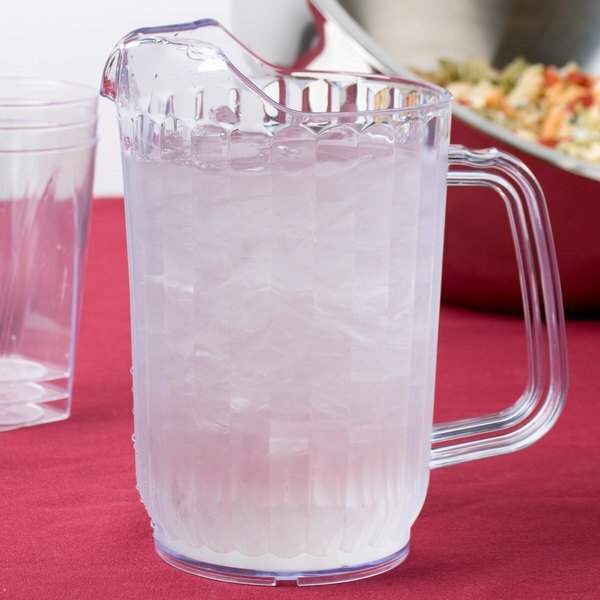 clear SAN plastic beverage pitcher! "The Choice 32 oz. 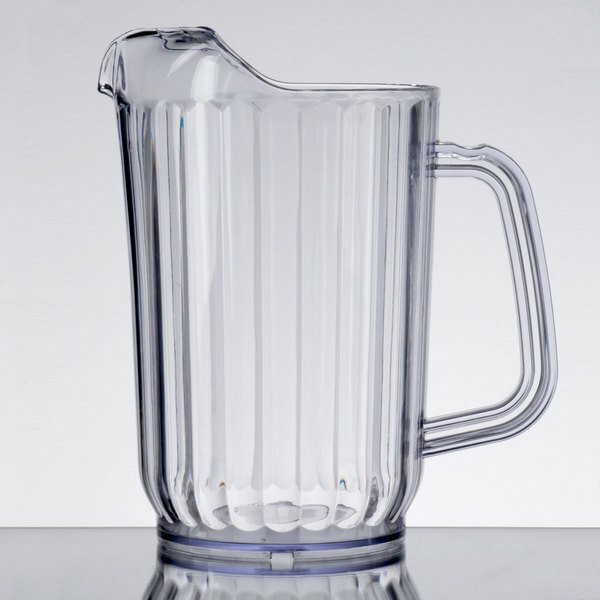 Clear SAN Plastic Beverage Pitcher has a comfortable grip and has high contoured sides so that it pours easily without splashing. 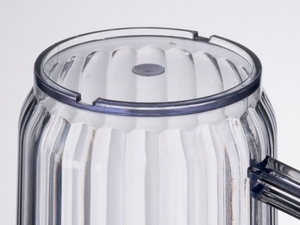 It made from clear durable plastic which guards against breakage. Looks great on the tables too!" SAN plastic is the perfect economic solution in high volume establishments where you need to have many pitchers on hand at once. Plus, its clear color allows your servers to easily identify its contents to avoid confusion and delays during service. 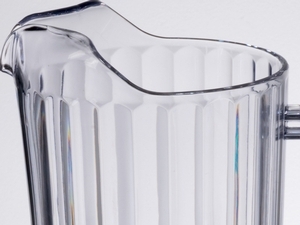 A practical design provides servers and guests with the ability to easily pour from the pitcher's middle. This helps provide customers with access to every last drop of your most popular beverages. 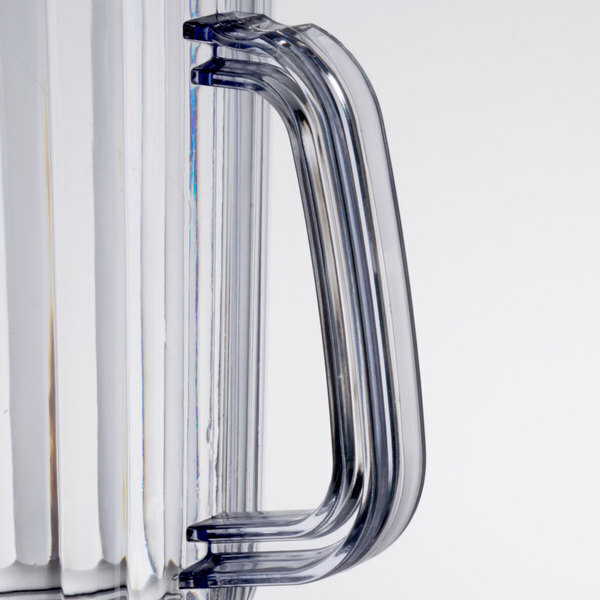 Designed to ensure efficient service, the integrated handle provides full control of the pitcher. Plus, a flat top provides comfortable thumb placement, allowing users to gain a secure grip and pour steadily. 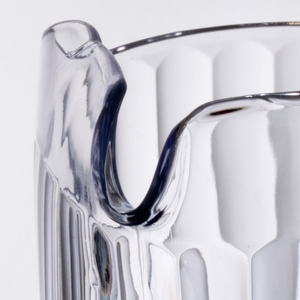 An attractive ridged exterior adds style and depth to the pitcher's design, helping it serve as the perfect beverage showcase. Suitable for any counter, table, or bar top, an elevated base provides sturdy support that prevents tipping or spilling of the pitcher. These were placed on the dinner tables. The size for us was just perfect (I didn't want them too tall). We had 8 people to a table & the glasses used were 8 oz 1-pc clear wine glasses. People were able to fill their glasses 1 time each before the pitcher was refilled. Loved that the lip did not drip the contents all over the table as some other pitchers do. Very happy with this purchase & the prices. Amazing quality. Fast shipping order on dec. 27 and it arrived on Dec. 28. Can wait to use them for an vendor event. Use again. Beverage pitchers go missing almost as much as pens for some reason, these 32 oz plastic work well for serving water, and they're inexpensive, don't crack when they drop they either. 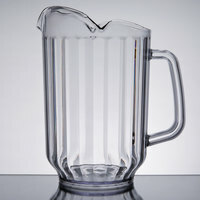 This is a wonderful pitcher. It pours great and doesn't cause dripping like other pitchers. Even though it's plastic, it's super durable and holds up well. Not that I did not like it, the quality was good but I ordered the wrong size. Did not open the box until the day of the event so was very disappointed. This size is half the size of a regular juice container. pitcher was a bit smaller than i had imagine but the quality is undeniable. the hand is very ergonomic and easy to use. 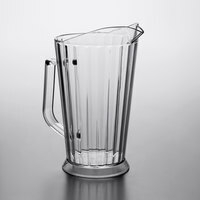 the clear pitcher really allow you to see what you are serving. would get these but in a larger size if you are serving a crowd of people. love. Haha, nothing is wrong with them, they actually seem like thick plastic and quite sturdy but 32 oz is very small- my bad, but make sure you know how big a 32 oz pitcher is before you buy! 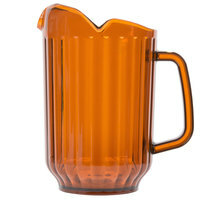 Great for ice water, ice tea, fruit punch, fruit juices, sodas, beer and other great beverages. I like pitches with SAN material plastic which makes it it dishwasher safe and strong for repetitive serving use. Purchased these for a baby shower event and couldn't have been more pleased. They didn't take up much table space and went well with the overall appeal of the decorations. A definite bang for your buck. This is what you would call a half pitcher. This is a 32 ounce choice clear plastic beverage pitcher. It comes with one large spout. This plastic is a very thick plastic. 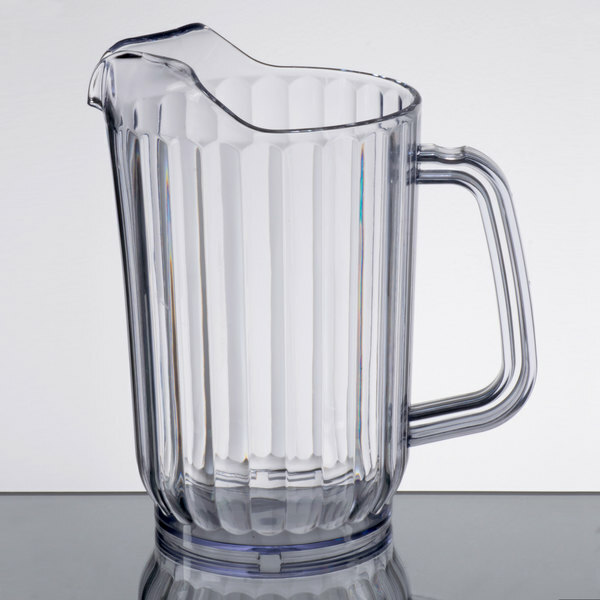 Words cannot express how excited we are to have CLEAR pitchers! The ones we had were cloudy from tea, not clean looking when you go to pour a beer. We replaced them all! Fantastic price! These pitchers worked perfectly for an event we catered this past weekend. They're adorable on the banquet tables! Just enough ice & water for dinner. So happy we purchased them. These were wonderful and we used them for a large event over the weekend. They are not as large as the standard pitchers but work great on tables when you have speakers because they do not block any views. They are also lightweight and easy to fill with beverages. Highly recommend. What's not to like? Very standard pitcher. Dishwasher safe, which is great for us. And can easily withstand heavy, daily use. Solid handle too, unlike other brands. For practical use and every day water pitcher. This one is the best!!! Easy to pour from. Easy to fill. Easy to clean!!! We have many. 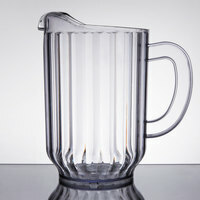 Use it as a water pitcher, beer pitcher, juice pitcher. Fantastic and very reasonably priced. An item we use daily. Love this!!! These are great little pitchers. They are the perfect size for using in a childcare setting where the children get to poor their own water and milk. The only reason I gave it 4 stars is because we have broken a few. But that's to be expected when using with young children! What a great price, very durable and long lasting. Machine washable. I have this product for a couple years and they can take a beating. Very durable!